We hear so much about the health benefits of tea that we can’t help but wonder about the side effects of tea too. The popularity of tea is growing rapidly. It is soothing, invigorating, and comes in a variety of flavors. What’s not to love, right? As one of the most popular beverages in the world, second only to water, it is important that you not only know the health benefits of tea, but that you’re also aware of the potential bad effects of tea on health. How is Tea Bad for Your Health? Medical/health studies and research are showing that there are some side effects of tea that have a bad effect on your health. These potential tea side effects can range from cancer (esophageal and prostate) to brittle bones. Let’s take a look at some of the ways tea may be bad for your health. 1. Hot tea may increase the risk of esophageal cancer. A 2008 study showed that drinking tea that is too hot may increase your risk of developing esophageal cancer. The study examined regular drinkers of black tea. Those who drank their tea hot (65-69°C/149-156°F) or very hot (over 70°C/158°) were more likely to develop esophageal cancer. It further found that those who drank their tea within 3 minutes of pouring had a greater cancer risk than those who allowed their tea to cool for 4 or more minutes prior to drinking. 2. Tea may cause osteofluorosis. There are cases of people who have damaged their bones by drinking too much tea. A case published in the New England Journal of Medicine details a 47-year-old woman who developed brittle bones and lost all of her teeth from drinking too much tea. Every day, she drank tea made from 100-150 tea bags, giving her a daily fluoride consumption > 20mg. Older tea leaves tend to contain more flouride than younger leaves, thus younger leaves may have a smaller risk. 3. Tea may increase the risk of prostate cancer. Research from the University of Glasgow linked heavy tea drinking with an increased risk of developing prostate cancer. The research indicated that men who drank seven or more cups of tea a day had a 50% higher risk of prostate cancer than those who drank little to no tea (0 to 3 cups daily). Drinking 4-6 cups a day didn’t significantly increase the risk over drinking 0-3 cups daily. Note: A link doesn’t mean that tea causes prostrate cancer. Other factors may have contributed to the results, including age, diet, stress, family history, etc. 4. Tea may have negative caffeine side effects. Tea naturally contains caffeine. While the benefits of caffeine include increased energy and alertness, if you consume too much or are sensitive to caffeine, you may experience some negative side effects. Common negative caffeine side effects include difficulty sleeping, increased heart rate, depression, anxiety, panic attacks, and more. Remember that caffeine can be addictive. If you reduce it or eliminate it completely, you may experience withdrawal symptoms, such as headaches, irritability, and nausea. 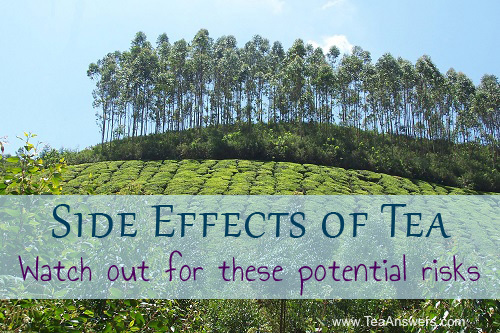 I hope you enjoyed learning about these possible bad side effects of tea on your health. As we learn more about tea, it’s important to stay up to date on tea side effects. Be sure to use common sense when drinking tea – don’t drink too much, allow it to cool some before drinking, don’t drink tea that is too concentrated, and don’t drink tea that may interfere with any medication you’re taking. Following these simple steps may help ensure that your relaxing cup of tea doesn’t cause bad health effects. And always check with your healthcare provider to make sure tea is safe for you, or if you have any questions or concerns about the side effects of tea.